1. I would start by letting everything you know about handbags in general go. 2. 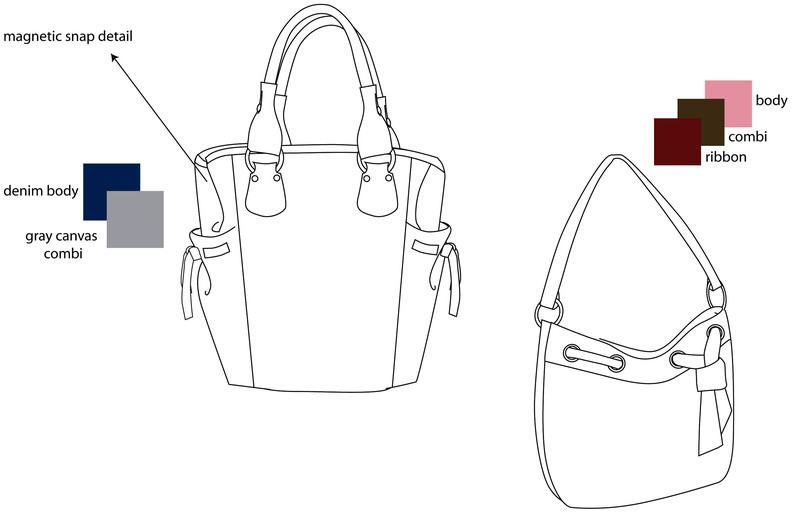 Write down what a handbag should do, do research if neccesary (for instance, should it be light, carry small items, large items, should items in the handbag be easily accessed, do I need special pockets for specific items? In general, what are the functions your product should have. 3. The next step could vary depending on the extensiveness of your research, I personally like to start by finding several kinds of different products, objects, things (living or otherwise) that aren't related to the product start thinking about how I could use this shape, sollution, design to make a handbag which incorporates the above named features. Try to be critical of your own work and that of others, if you see something you aren't happy with, work on it to make it the best you can. The same goes for reviewing inspiration, don't just look at the sollution an inspirational source delivers, try to find stuff that is wrong with it and make it better. 4. Don't be to specific at first, think in broad-lines, there is always time to go into details. Of course, this is just one approach but I find it a good start to work on new products. Nephtis' points are excellent, specially no. 1.
however, when i read your topic i immediately thought of formal inspiration and thought about fish... i was watching some HD documentary on deep sea fish and the shapes, colours and movements could give you amazing ideas for a handbag. What it comes down to in terms of designing a product using something else (such as animals) is observation. You need to find a way to incorporate what sets the animal (just an example, this applies to anything) apart from everything else. A tiger for instance has striped patterns that instantly recognizable. Let's take your example of shoes. Is it a specific type of shoe? Can you focus on the material or the color scheme of the shoe? If you incorporated the material and color would it automatically make the handbag seem like it's a shoe? Or perhaps you need to take it a step further. Shoes have laces, perhaps that could be a way that the handbag is sealed, as opposed to a clasp or a zipper. As designers we should be aware of the basic things that set object apart so that when we would like to incorporate other forms into our design (such as a shoe) then it is possible for us to draw that as inspiration. I think what would be very helpful is to give yourself a design criteria. Sometimes having a completely open ended system stifles your creativity because you're just overwhelmed by the possibilities. For example: If you want to create a hand bag that's inspired by aquatic animals then you will naturally focus your research on fish and other creatures that live in water. This way you can focus your styling instead of grabbing inspiration from hundreds of different things that would be very difficult to pull together into a single coherent design, you have just a couple strong designs you can draw from that all have a similar origin (Water creatures). Please don't confuse what I'm saying here about giving yourself a design criteria. It's not meant to be so specific that it makes you feel crowded. Rather, it should be a way that helps you get a clear idea of what YOU want. If you've come to a point where you feel like you've designed yourself into a corner, don't be afraid to take a step back and broaden your criteria. If you've gone from deep sea aquatic animals and feel that you're restrained, then go back to just aquatic animals in general. yeah,I think you're right...I have problems on focusing my ideas,it's just too over crowded for me...to a point wherein I do not know what to prioritize... I will definitely try on observing other products like what you've said. :thumbsup: thanks a lot! just add a lil bit..
ummm i think what u guys talked up there is kinda "micro designing", what i mean by that, is, those methods just deal with the designing of the product itself. *) is much more than that, the environment, social context, technological aspect, culture aspect, or marketing strategy, are at least just as important as the form or function of a product. *) should hav an idea, character, and message. and these things should be communicated through form. so... it still a long long journey..
yeah i agree with you..my boss always reminds me to consider the target market of our brand,which is the teens bracket group...can you give me some advice on designing for them? hmmm i dont understand what u mean w "bracket group".. but u can search images on the net that could represent you target market.. so that u get the "mood" to develop the design language for the product.. (thats why such thing called moodboard, and not because it hav to have ipod or mini cooper on it). you can do this on the different segment, such product, brand, architecture, material, and so on..
basically u can read almost any book and apply it on your product design strategy. from politics, environment, social... cos like i said, idea and message is the powerful thing behind any design. and you can develop ur vision as basic idea or message for a design only if you read a lot..
ps: i hope more people on this forum dealin with these problem ( macro designing )..
just a simple tipp, always try to interpret a design not only by saying its cool, its shiny its modern or its ugly, but try to analyse what is the designer trying to say with this design..
yeah thanks for that advice...uhm I am uploading my recent handbag design,rendered in Adobe Illustrator...what do you think about it? You bring up an excellent point. I didn't consider this during my explanation because his question was simply on how to go about integrating inspiration from unrelated objects or things into his design. An answer more than that would be irrelevant to his original question. These topics, ofcourse, are important when designing and are usually included in a design brief that specifies who, what, when, where, why as well as how. What inspired such design? Perhaps if you included an image of your inspiration it would be easier to critique as to how well you have integrated your inspiration into your design. As of right now. It's a bag, yes, and....? I notice they're two different bags, reasoning for the different designs? Please clarify your reasoning. Yeah, I agree with P3NGU1N, the topic was about how to take inspiration from a product, object, lifeform, not how to design a product in the macro-sense. Of course, in general you should consider the steps huakakak describes, but I think you should allready have done that when you step up to your drawing-board. The hardest thing in designing something is starting from scratch. If you have a concept and find problems with the design, you also have a direct subject that needs a solution and you can work towards finding that sollution. As long as you have a goal, you can find a way to design towards it. 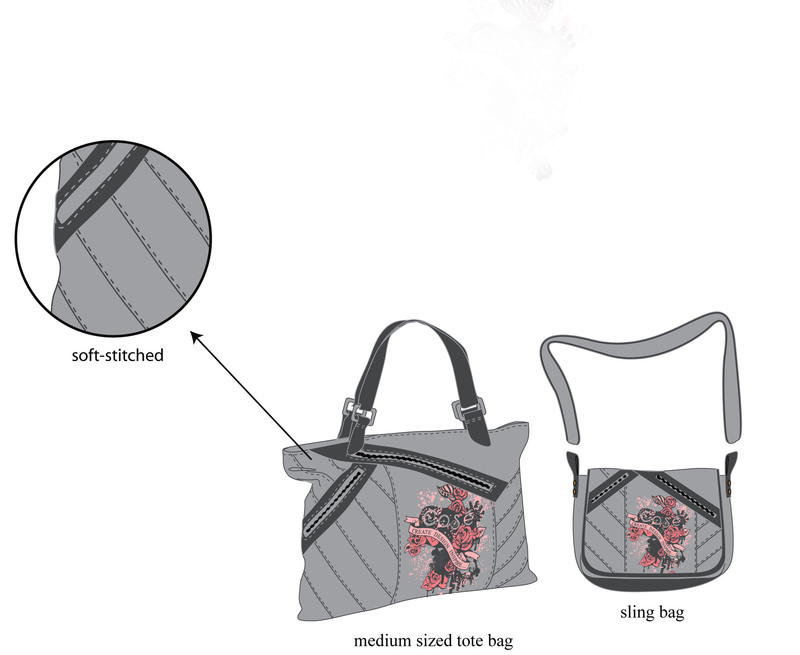 If you just start with a notion "lets design a handbag" and go into sketching immedeatly, I garantee you will not succeed. You might design something beautifull but it will be out of context and without meaning. OOOH and by the way, nice concepts, looks cool. I just hope that you don't forget to go into simple sketching, these drawings might be to worked out for this phase, you shouldn't spend to much time on each idea, just use your sketches as a way to "write-down" you ideas.